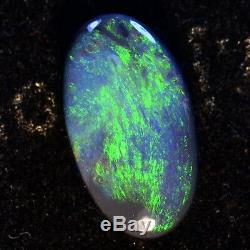 Lovely bright greens and blue undertones in this natural solid black opal. 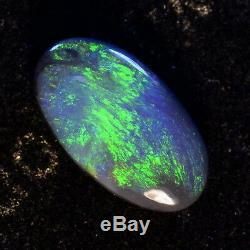 Mined in Lightning Ridge Australia, this 1.24 carats 10.20mm X 5.80mm X 3.30mm gem would make a gorgeous black opal engagement ring or perhaps with a few diamonds a black opal cocktail ring. 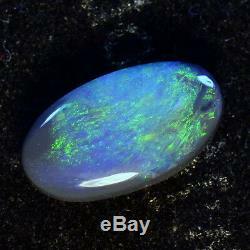 This totally natural N2, 4.1 out of 5 bright, untreated solid Australian opal is sure to put a smile on the face of its new owner. 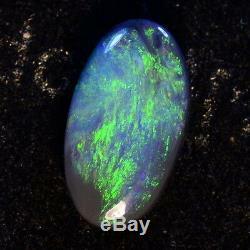 Fiery green solid Australian black opal m12868 - YouTube. We can accept credit cards and electronic transfers through. International Buyers - Please Note. Our reputation is paramount, without it we would not have been in business and the opal industry since 1967. We treat our customers with the respect we would like them to treat us with. 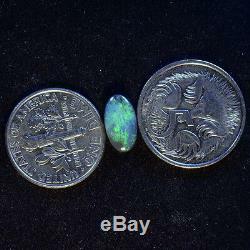 The item "SOLID AUSTRALIAN LIGHTNING RIDGE BLACK OPAL WITH WONDERFUL BRIGHT GREENS 12868" is in sale since Sunday, December 10, 2017. This item is in the category "Jewelry & Watches\Loose Diamonds & Gemstones\Loose Gemstones\Opal\Other Opals".